Chestnuts are a classic Christmas ingredient, often used in stuffings. This rich, lemony version is used to fill halved peppers and then baked for a colourful meat-free main course. The stuffing is also delicious on its own or used to fill the neck end of a chicken, turkey or goose. Preheat the oven to 180°C, gas mark 4. In a large bowl, mix together all the ingredients except the peppers and mozzarella. Season generously with salt and freshly ground black pepper. Using a sharp knife, cut the peppers in half through the stalk. Deseed and divide the stuffing equally between the pepper halves. Place in a baking tin. Grate the mozzarella and sprinkle over the top. 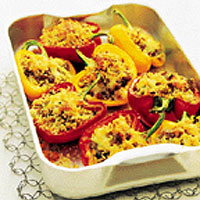 Bake for 25-30 minutes until golden and the peppers are tender. Serve immediately. The stuffing can be used to stuff the neck end of a chicken, turkey or goose. Alternatively, roll into 16 walnut-sized balls and bake at 180C, gas mark 4 for 15-20 minutes until golden.